The maxillary expander is an appliance that is generally used to make the top jaw wider. It is one of the most commonly used early treatment appliances. Maxillary expansion works best at a younger age. At a young age the upper jaw is still made of two halves right and left. A maxillary expander widens the upper jaw by moving the two halves apart using the back teeth as an anchor. The jaw then develops to become wider and accommodate more teeth. 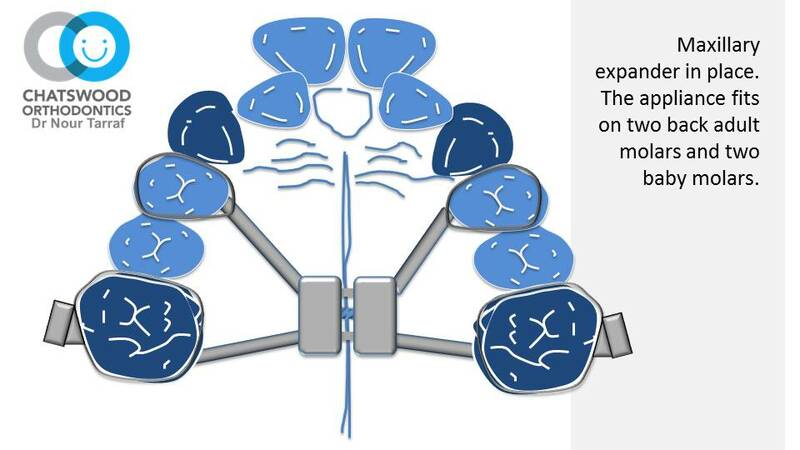 Additionally it has a positive influence by widening the airway and improving breathing function. 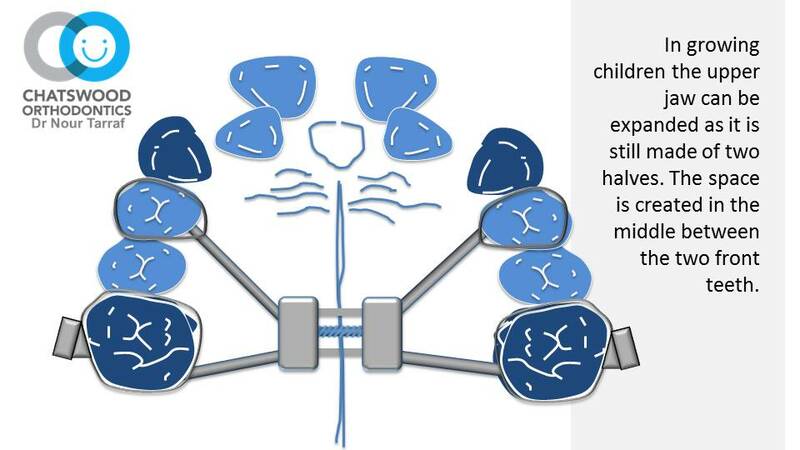 Maxillary expansion can also have a major beneficial impact on breathing and airway. Studies have shown that when correctly timed it can help resolve serious problem like childhood sleep apnoea and sleep disordered breathing. Things like bedwetting secondary to sleep apnoea can also be resolved. A Herbst Appliance is a functional device similar to the Twin Block, which helps improve the way your upper and lower jaws fit together. The Herbst appliance is made of steel crowns that are cemented on the permanent molars. Telescopic arms connect the upper and lower jaws. Lengthening the arms propels the lower jaw forward into the desired position. Once the jaw is positioned properly, the Herbst is left in place for 10 months. Once this Phase 1 treatment is complete, braces are fitted to position the teeth into an ideal occlusion. The Twin Block appliance is an orthopaedic, Phase 1 appliance aimed at aligning the jaws in the transverse, sagittal and vertical dimensions. This appliance consists of separate upper and lower plates. The upper plate includes an expansion screw for lateral development and plastic pads to cover the molars. 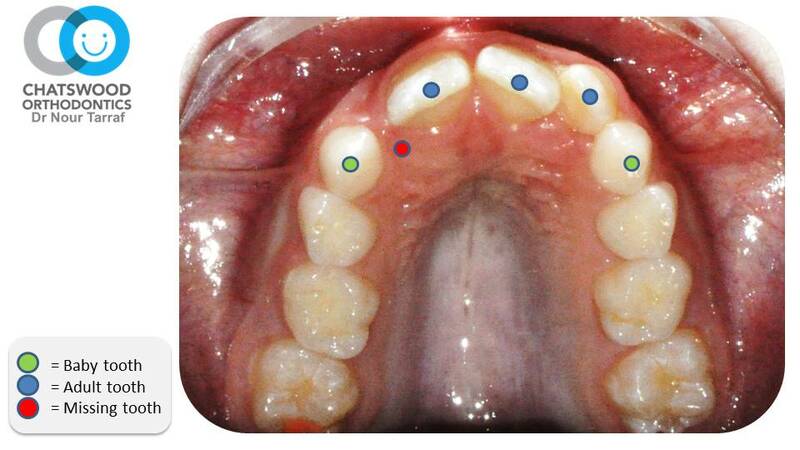 The lower plate includes plastic pads to cover the lower premolars. The Twin Block appliance is worn full-time (even when eating) and only removed when brushing teeth. 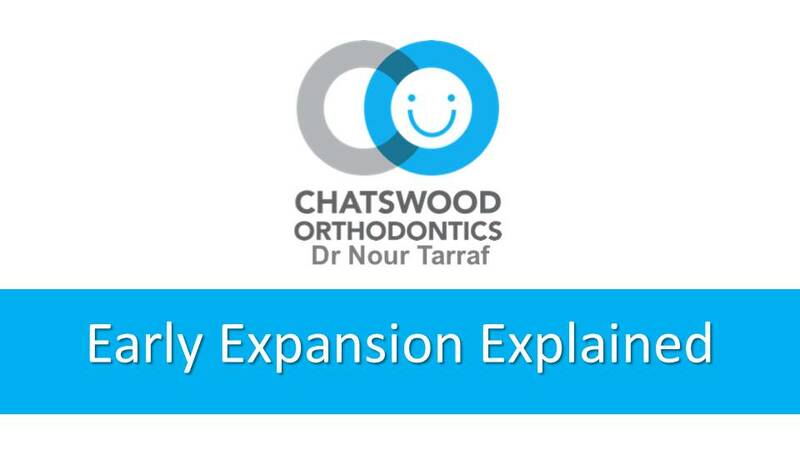 Treatment time is approximately 12 months and is usually followed by Phase 2 Comprehensive orthodontic treatment to correct tooth alignment, co-ordinate the upper and lower arches and lock the bite into the correct position. Why use a Twin Block appliance? Reverse Headgear is utilised to help correct an under-developed or small upper jaw. The ideal age for this type of treatment is between ages 7-11, when the facial structures are still developing. Headgear is worn at home only, for about 12-14 hours per day. 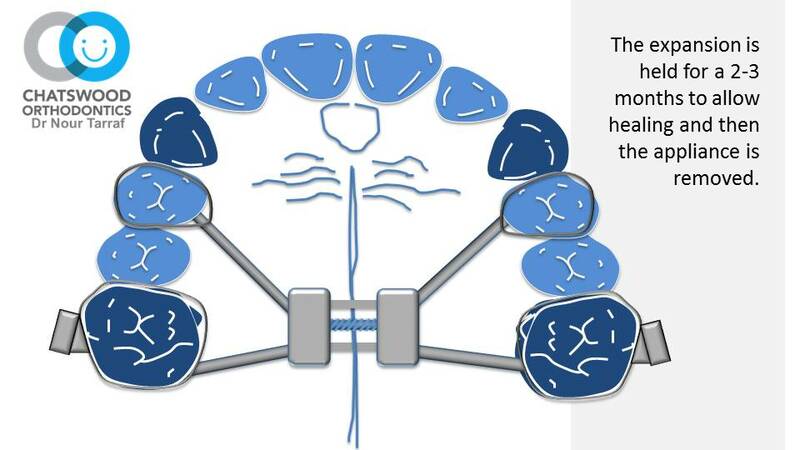 The headgear requires rubber bands which attach it to an upper fixed expander or a holding arch in the mouth. The rubber bands create a forward pull on the upper teeth and jaw. Because the reverse headgear rests on the chin and forehead, a reciprocal or backward directed force is placed on the lower jaw. The overall effect is forward pressure on the upper jaw and backward pressure on the lower jaw. The Fixed Tongue/Habit Guard acts as a reminder by making it difficult to fit the thumb in the mouth. It maintains and protects the arch width against the force of a thumb. It is intended to keep the tongue back, so that the front teeth can complete normal eruption. This appliance can be used in conjunction with a palatal expander, which widens a constricted palate to a normal shape. Like to learn more about Phase 1 Appliances?